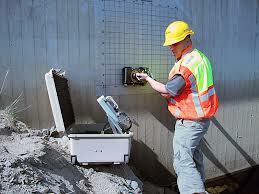 GPR One Call Provides a proffesional concrete scanning service, for your industrial, commerical, and residential needs. Our experienced technicians collect and display real-time data using the newest and best ground penetrating radar (GPR) available. Concrete scanning with GPR allows our technician to find embedded electrical conduits, rebar, pvc pipes, metal pipes, and post tension cables. The results are marked with permenant marker, removable chalk, or on a paper overlay. Clients use concrete scanning when core drilling, cutting or remodeling for safety and to help avoid unnecessary damage and delays. Trained technicians are able to locate rebar and post-tension cables within the concrete using GPR technology. Steel reinforcement locations are marked directly on the work surface (unless otherwise requested) to ensure safe and efficient drilling. Accurate detection of electrical conduits is essential for preventing safety risks, power outages and costly damages. Voids are often undetectable from the surface, occuring over time due to pipe ruptures, erosion, or compaction over time. With our GPR technology and skilled technicians, GPR One Call can expose air gaps between the sub-grade, dirt and the concrete slab-on-grade.